“Reggae on the River” may no longer be the unquestionable leader of the California reggae movement as it was five years ago, but has evolved into a heated issue bringing forth differing opinions and vitriolic argument from all sides. The Humboldt County Reggae on the River/Reggae Rising Conflict, or more specifically, the Mateel Community Center/People Production/Dimmick Ranch Conflict, has escalated over the years to the breaking point, resulting in the emergence of (and this year’s cancellation of) the more recent Reggae Rising festival at Dimmick Ranch, and the re-creation of Mateel’s original not-for-profit Reggae on the River, now located at Benbow Lake State Recreation Area. It all began back in 2006 when Reggae on the River failed to earn revenue and a bitter legal crusade developed between the Mateel Community Center (owner and founder of Reggae on the River), and People Productions, the company involved in delivering the show. Tom Dimmick, landowner of the gorgeous riverside valley which had become the new festival home that year, was also a key player for People Productions. 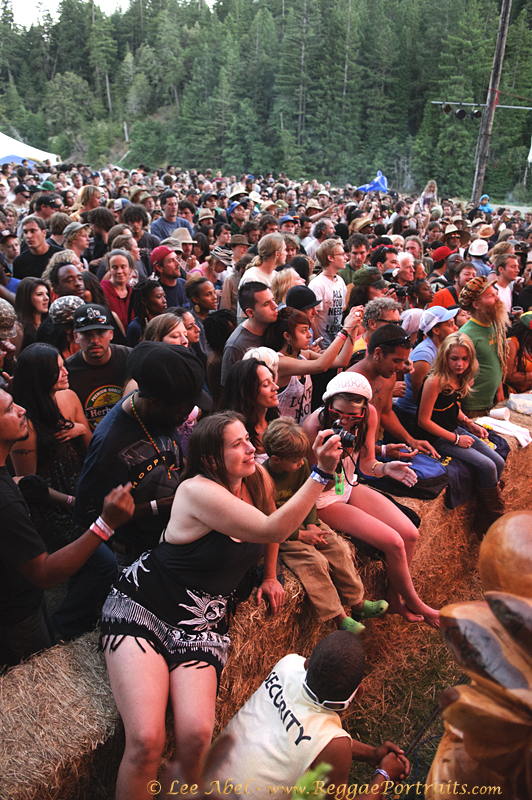 Reggae Rising emerged out of the bedlam with the Carol Bruno (with People Productions) and Dimmick Ranch new business alliance, which continued through 2009. Mateel clung ardently to the trademark of the iconic “Reggae on the River” name and put on small one-day festivals at Benbow in 2008 and 2009. Though the festival was much smaller than its massive predecessor and in many locals’ eyes an unfortunate replacement, it was the best Mateel could do given the current circumstances, as Mateel is a non-profit community center which has worked hard to stay afloat. The 2006 battle over revenue was not necessarily a conflict based on greed, but a battle for Mateel to stay afloat with lost money they had been promised by the for-profit People Productions. Though the new festival may be smaller and disappoint many of the diehard fans who attended Reggae on the River since its inception in 1983, it is nonetheless a testament to the will and passion of the people who refuse to let Reggae on the River drown, regardless of budget restrictions and ensuing legal battles. 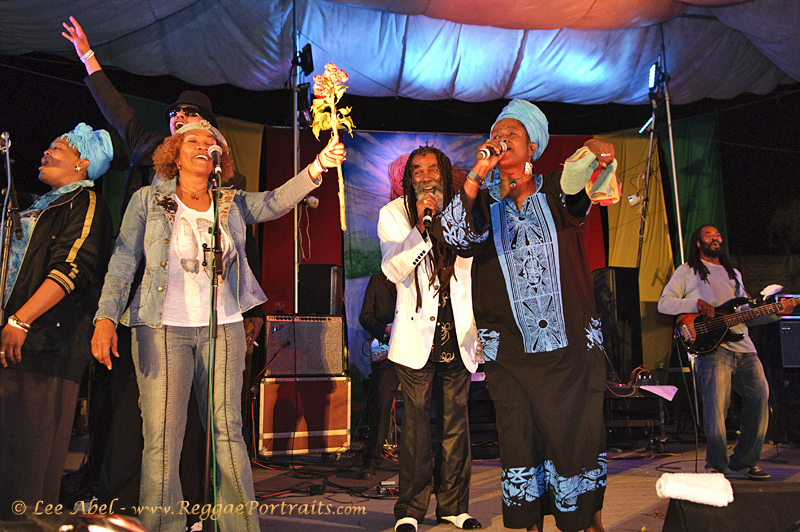 Marcia Griffiths, Don Carlos, and Sister Carol pay tribute to the late Sugar Minott; Photo by Lee Abel. This year, the festival grew into a two day event. Nestled in a gorgeous riverside park down the street from the Benbow Inn, the festival showcased fabulous acts by big players including Sly and Robbie, Marcia Griffiths, Sister Carol, Prezident Brown, and Don Carlos. Lesser known groups such as Antibalas, a dynamic mix of latin, jazz, and funk, and the ever-engaging Rootz Underground gave truly standout performances. A special highlight was the festival’s finale act – a tribute to the late Sugar Minott who was on the original bill but sadly passed away shortly before the event. Marcia Griffiths, Sister Carol, Prezident Brown, Fenton of the Reggae Angels, and Don Carlos all took part in this moving tribute to the reggae icon. Regardless of the seemingly endless conflict, Reggae on the River proudly demonstrated a dedication to the original values of love, community, and music on which it was founded. A little sleepy compared to years passed (and slightly difficult to navigate with the slow bus shuttle systems shuffling people to and from the camping area a couple miles away), but nonetheless a weekend full of great vibes, energy, and positivity. Taylor Price has loved Reggae ever since she can remember. She attended her first Reggae festival, Reggae on the River, at the age of 14, and has been a passionate devotee ever since. Taylor recently graduated from UCLA and is excited to combine her love of writing and Reggae with Jahworks.org!